Man who started experiencing pattern hair loss at age 27 decided camouflage his progressive lack of hair coverage with scalp micropigmentation, a cosmetic procedure using scalp tattooing to simulate hair density. However, with progressive pattern hair loss, by age 32 the tattoos became more visible and were not concealing his frontal hair recession. 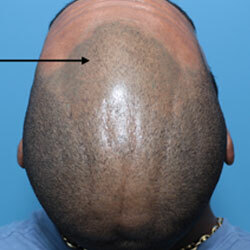 Hair coverage receding at the hairline, showing only the shadow look of micropigmentation. 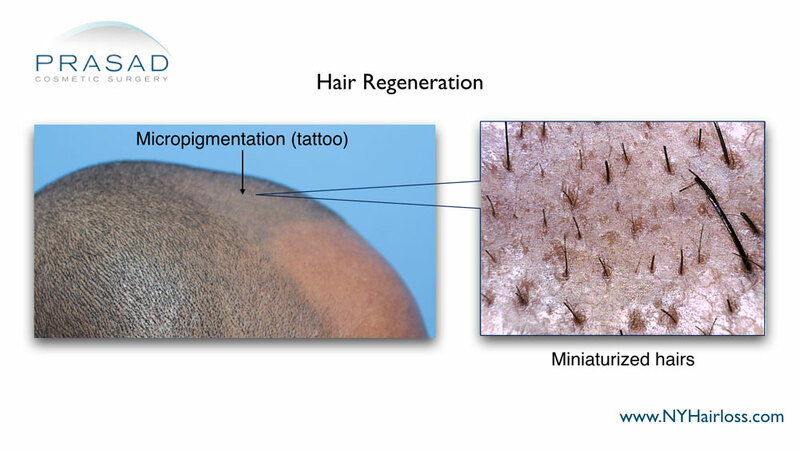 Scalp microscopy showed hairs were still present, but too thinned to be visible over the micropigmentation. He came in for consultation, and had the Hair Regeneration treatment. He never took finasteride, but was prescribed the DHT-blocker the same time as treatment. 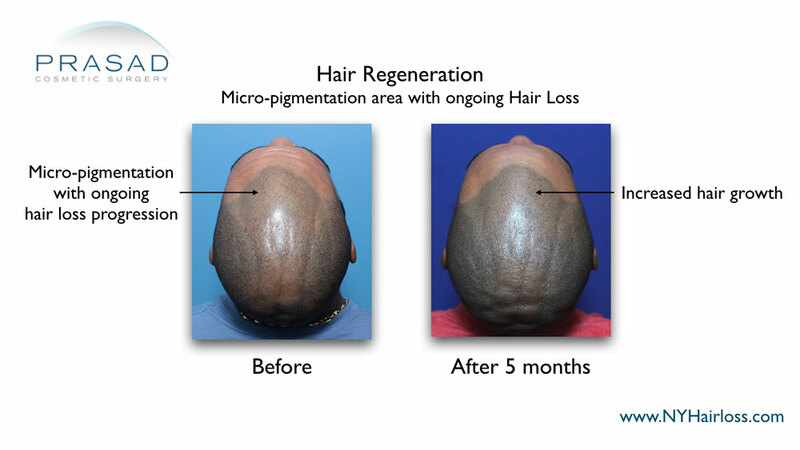 One Hair Regeneration treatment was able to stimulate hair growth and thicken thinning hair at the frontal hairline, which enabled better blending of new hair coverage with the surrounding micropigmentation for a more natural look. He came back for follow up 5 months after his treatment. He was very impressed with new hair growth at his hairline, and was no longer self-conscious about his micropigmentation being revealed by the lack of hair coverage. His new hair coverage blended well with scalp pigmentation, giving him a more natural, full look.